She is the protective, helpful and comforting mother who shows limitless kindness, generosity and protection towards those who are tossed in the ocean of suffering, and if we recite her mantra and make a connection to her, we draw closer to developing her enlightened qualities in ourselves. Ultimately, she is the very nature of the Dharmakaya – “the ultimate nature or essence of the enlightened mind, which is uncreated, free from the limits of conceptual elaboration, empty of inherent existence, naturally radiant, beyond duality and spacious like the sky” (definition by Karma Lingpa). Her practice is a means for attaining liberation. Tara's seed syllable, "Tam", and mantra. 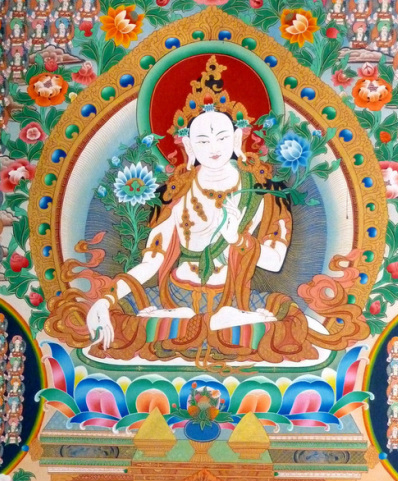 His Eminence Garchen Rinpoche has taught extensively on the benefits of White Tara practice. Practiced by all four major schools of Tibetan Buddhism, White Tara has been the main deity practice of many well-known Buddhist scholars and siddhas in both India and Tibet, foremost among whom where Nagarjuna and Atisha. White Tara’s special function is to promote long life, peace, prosperity and health through her enlightened activities, both for the practitioner and for others. She is seen as is a beautiful loving mother figure, with a body that is the brilliant white of a thousand autumn moons. She seated in the posture of the vajra (thunderbolt) above a white moon disc and an open lotus. Her aura glows, as various colored rings framed with lotus blossoms surround her. Her garments are elaborately decorated with ornaments; on her head she wears a sparkling crown, crested by Amitaba himself; and she is adorned with beautiful jewelery - a long and a short necklace, as well as various gold and jewel ornaments. Her right hand rests across her knee in the mudra of supreme generosity, while her left hand holds near her heart the stem of a uptala flower, which is blossoming near her left ear. White Tara is always depicted as a peaceful deity. White Tara has seven eyes. She has three eyes on her face, the third eye in her forehead symbolizing her ability to see the unity of ultimate reality, while her two other eyes simultaneously see the relative and dualistic worlds. She has one eye on each palm of her hands and feet, showing that all her actions are governed by her ultimate wisdom and compassion. It is said that White Tara's seven eyes enable her to clearly "see" all beings in all the realms of existence. Her expression is one of the utmost compassion.